HI-TECH Synadrene is a fat burner containing vitamins of the B complex (B12, B3, B6), chromium, and a proprietary blend of such ingredients as: DMAA, yohimbine, ALA, sulbutiamine, a green tea extract, and methylxanthine. Thanks to its amazing contents, the preparation can increase the level of physical and mental energy, reduce appetite, and stimulate metabolism, which translates into better results during the periods of fatty tissue reduction. The group of methylxanthines consists of caffeine, theobromine, and theophylline. Their effects stem not only from the ability to inhibit the breakdown of cAMP and cGMP in cells, but also from their antagonist activity to adenosine receptors. The substances exhibit various affinity and power of activity regarding the enzymes phosphodiesterases and adenosine receptors, thanks to which they have different pharmacological properties. Theophylline causes the dilation of bronchi and blood vessels, while caffeine and theobromine exhibit the ability to stimulate the organism, increase heat production and reduce the symptoms of tiredness. Methylxanthines have a beneficial effect on the oxygen management of the organism on the activation of other effects, thanks to which they increase exercise capacity. The green tea extract helps to lose weight effectively by affecting the reduction of appetite and the inhibition of fat digestion. The main active components, polyphenols, are one of the most powerful substances when it comes to antioxidant potential. Moreover, green tea contains a large amount of epigallocatechin gallate (EGCG) whose antioxidant properties can be even 100 times stronger than those of vitamin C. When combined with the other ingredients of the supplement, the extract helps to maintain good health and supports your efforts during the periods of fat burning. 1,3-Dimethylamylamine HCL (DMAA, geranamine) is one of the stronger components you can find in pre-workout supplements and thermogenics. DMAA leads to an increase in noradrenaline levels, which causes the stimulation of the CNS, an improvement in exercise capacity, and an increase of concentration and thermogenesis. Sulbutiamine is a vitamin B1 derivative; it is built from its two subunits, and its main property is the nootropic effect. The substance helps to increase the performance of the nervous system, stimulate mental processes, and enhance cognitive functions. Thanks to its lipolytic properties, yohimbine is a substance commonly used in order to reduce fatty tissue. There is plenty of scientific evidence that it is a blocker of α2-adrenergic receptors, thanks to which it enables more efficient energy generation from free fatty acids stored in cells, which speeds up the process of weight loss. Because of its possible effect on the increase in adrenaline and noradrenaline secretion, it is used as a stimulant for increasing the activity of the sympathetic nervous system. Its unique property reported by its users is the ability to eliminate fat from the most resistant spots, such as the abdomen, thighs or buttocks. Moreover, it is worth noting that yohimbine can improve sexual experience and performance and increase the libido. Alpha-lipoic acid (ALA) is an antioxidant that improves the organism’s ability to absorb and transform carbohydrates into energy (an insulin-like effect), which makes it a perfect help for reducing fatty tissue. ALA supplementation is safe and recommended on a diet rich in carbohydrates because it increases their absorption as well as that of other nutrients directly to muscles. Poly-iiodo-thyronine is a thyroid hormone analogue that can become a product for triiodothyronine (T3) synthesis through deionisation. Having entered a cell, T3 binds with its specific nuclear receptor which initiates the right DNA sequence, affecting gene transcription. There occurs increased production of mitochondrial enzymes, which leads to a metabolic boost, increased oxygen consumption and heat production in the entire organism. The main functions of vitamin B12 (cyanocobalamin) are: participating in carbohydrate, fat and protein metabolism, regulating the production of red blood cells, and affecting the normal functioning of the nervous system. Moreover, it takes part in regulating the level of homocysteine, which is believed to be an independent risk factor of developing neurodegenerative and cardiovascular system diseases, foetal malformations, and cancer. Vitamin B3 (niacin) participates in energy metabolism, regulating blood cholesterol levels, erythrocyte production, reducing the toxic effect of drugs and chemical compounds, it has a beneficial effect on the nervous system and the mental condition, and improves the blood supply of the skin and the condition of hair. Vitamin B6 (pyridoxine hydrochloride) increases the organism’s immunity and participates in the production of antibodies. It takes part in energy metabolism and the transformation of tryptophan into vitamin PP and increases the level of the vitamin in the organism. Pyridoxine is also essential for the production of porphyrins (haem synthesis for haemoglobin in the production of red blood cells) and hormones (like histamine, serotonin). The addition of chromium in thermogenics helps to reduce appetite, control metabolism and maintain the results achieved. The element also plays an important role in the normal functioning of insulin receptors as a part of the glucose tolerance factor (GTF). The substance is produced in the liver and released to the blood during an increase in glucose or insulin levels. Along with insulin, it enables the permeation of glucose, amino acids and fatty acids to cells, and accelerates their metabolism. 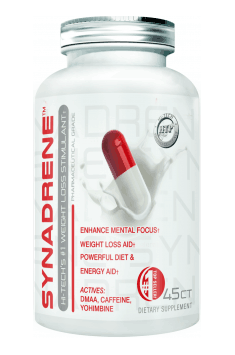 To sum up, HI-TECH Synadrene is a dietary supplement that can boost energy for the entire day and accelerate metabolism when taken in the morning. When used before workout, it can help to increase concentration and the level of exercise capacity. It plays the role of a powerful fat burner and a strong stimulant. It is a perfect preparation for people who want to get rid of excess fatty tissue and enhance muscle definition. The product can also reduce appetite and eliminate the feeling of hunger. Thanks to the content of high-quality stimulants, you can feel an energy boost that will motivate you more to raise the game and achieve your goals.